For the 2nd time this still young tri season, I spent the day before a triathlon helping someone move. And this was no small undertaking...moving my parents out of the house they have lived in for 27 years! But I wouldn't miss it for the world, especially since all my other family members were there, and they wouldn't let me forget it! Seriously though, it's a little nostalgic, emptying my childhood home and seeing all of the stuff boxed up and then in a different house. Did I mention that Kimberly and I bought my parents' old home, and will be filling it up with our own stuff very soon? It's a very exciting (and busy) time indeed! And my parents new home is wonderful, and I look forward to making great memories there too! It's only about 5 blocks away - and it has a pool, hot tub and fire pit. Race morning came with a 4:30 AM alarm, and hitting the road at a little after 5 with Kimberly. The race was about an hour and 20 minutes northwest of Tyler, on beautiful Lake Tawakoni. Actually, it's really not that beautiful compared to most other East Texas lakes...no offense, DFW people, who seem to claim this lake. The swim went off without a hitch, and I found myself alone in 2nd place...first was way up there, and everyone else was well behind me. 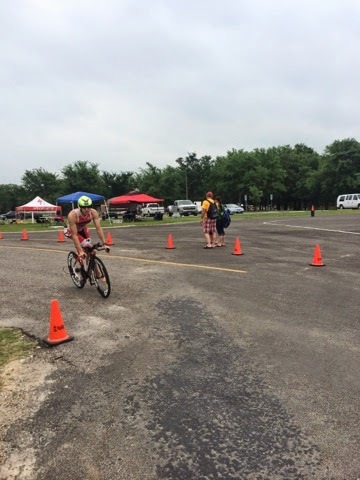 For the first tri this season, I didn't draft almost the whole swim, in fact, I didn't draft at all. 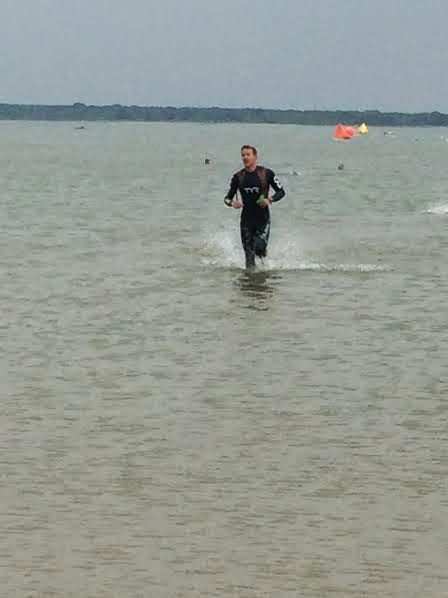 The water was pretty rough, what with the 20+ mph winds, etc, but I was pretty happy with my swim. My TYR Hurricane wetsuit and TYR NestPro goggles performed admirably. As I left the water, Kimberly informed me that I was 2 minutes back from 1st place...that dude had a fast swim. The first 5 or 6 miles of the bike went directly into the wind, and everyone suffered...everyone except Seth Cooke, that is. He passed me around mile 4 of the bike and I tried to go with him. Once we turned out of the wind, he was still just in front of me (more than 3 bike lengths, of course), and I kept him within eye-sight most of the bike - which meant I had a pretty good bike! Coming off of the bike, the Kimberlys (since Seth and I both have significant others named Kimberly) informed me that Seth was first and I was 2nd. So we must've passed the dude that beat me in the swim and just not known about it because of the bazillion other people that were racing the sprint version of the tri....right? Wrong! After passing Seth early in the run and completing the first lap of the 2 lap run course, the Kimberlys retracted their earlier statement and told me there was still a dude in front of me. 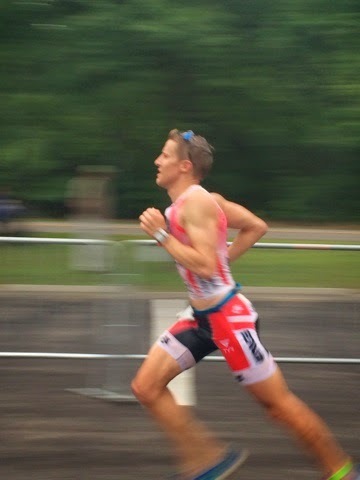 Fortunately, the run went well for me, and I caught the very fast Adam O'Connor (who is only 20 years old and has a very bright tri future) with a mile to go. Ended up getting an Oly distance PR of 1:59:26! I left little time for recovery after the Wiki Wiki Man Tri, and made a final push leading up to my taper for Ironman Texas. 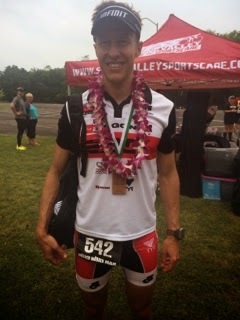 The following weekend marked 2 weeks before IMTX, and included 170 miles on the bike and about 25 miles running. 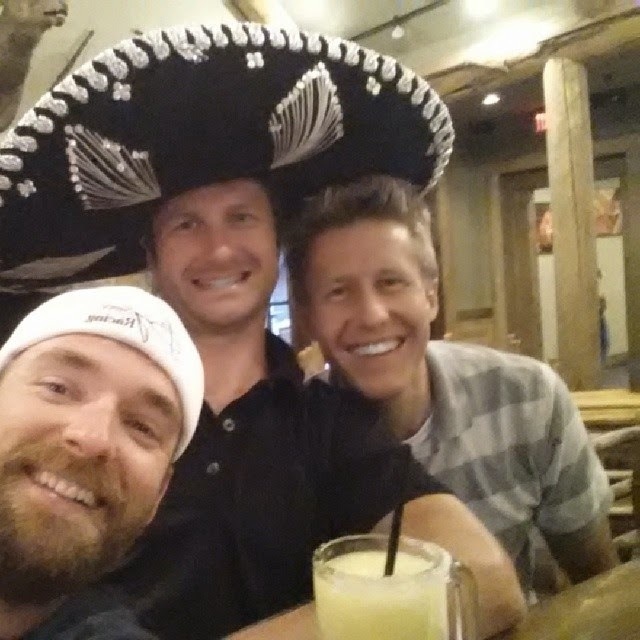 Monday, May 5th, aka Cinco de Mayo marked the official beginning of my taper, 12 days before IMTX. Just because taper was here didn't mean I could stop working out! In fact, I believe that is one of the most common misconceptions of tapering. To taper doesn't mean to stop working out, or even take it easy working out, really. It means tapering your workouts. Mostly, it means to cut back on the length of workouts, not the intensity of them. The beginning of a taper should be hardly any different than before, just a little shorter workouts...then they get shorter and shorter, maintaining the same level of intensity, until the race day. At least that's the way I interpret it. The Race for the Cure is always the weekend before IMTX, and I can't resist but to race it! Not sure whether this is a smart move or not, considering that it is 16 minutes of mostly anaerobic intensity, but I think it's OK. It was a pretty humid morning, and Seth and I worked up a pretty good sweat in our 2 mile warm-up. The race went very well, and for the 4th year in a row, I came away victorious! This run is for a great cause and is always well-attended with enthusiastic runners, volunteers and spectators. It also has a special place in my heart because the first year that I won it was a very hard fought race, and it was on the same day as my Grandma's funeral. She was always very interested in my races, and would've loved to know that after a good 10 years of running that race, I had finally won it. 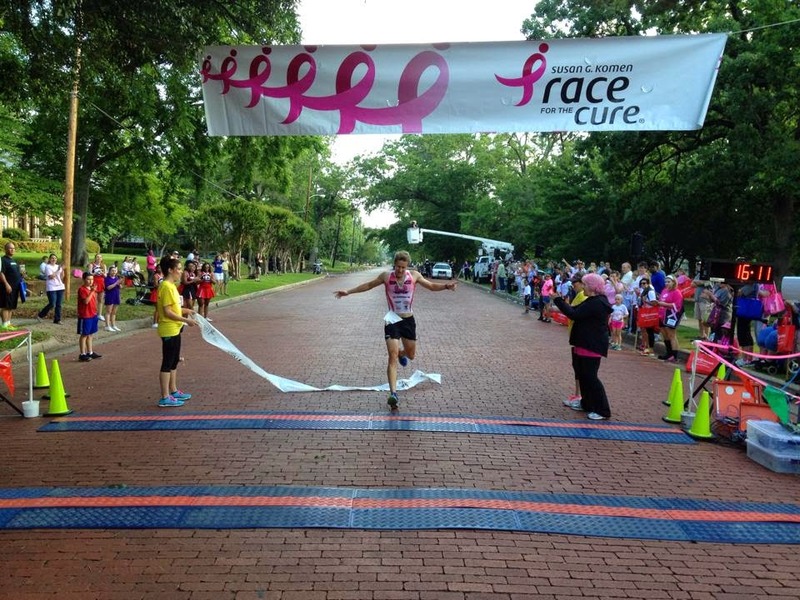 Finishing the Race for the Cure! 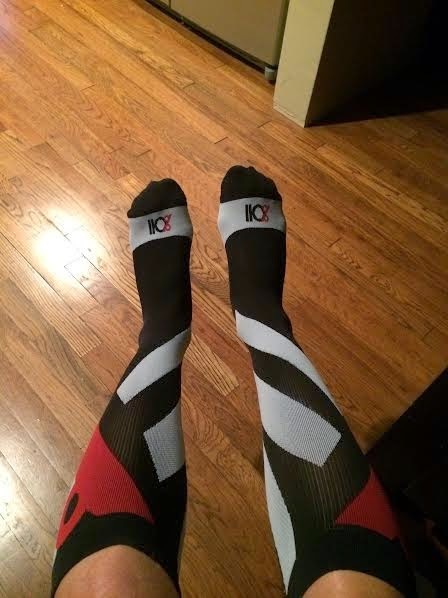 110% Play Harder compression socks! Other things I need to do this week to get ready for the race include cleaning my bike/chain and packing up all my stuff! I've done some open-water-swims with Kimberly over the last week, and have gotten more comfortable in my TYR wetsuit and TYR Torque Pro skin suit. It looks like it'll be a coin toss as to whether or not this race will be wetsuit-legal, but I will be ready either way! I also plan on Primal Sport Mudding my legs a couple more times and a little more foam-rolling. At some point I may break down and get a real massage, but these other methods seem to work pretty well! As far as nutrition goes, Kimberly and I both plan on leaning heavily on Infinit Nutrition, using my custom formula as a mix in our bottles that we start with on the bike and receive halfway at our hand-ups. We also have recently started using Infinit's gel alternative called Napalm. Kimberly has never been able to stomach energy gels, but she loves Napalm! Philippians 4:4-7 "4 Rejoice in the Lord always. I will say it again: Rejoice! 5 Let your gentleness be evident to all. The Lord is near. 6 Do not be anxious about anything, but in every situation, by prayer and petition, with thanksgiving, present your requests to God. 7 And the peace of God, which transcends all understanding, will guard your hearts and your minds in Christ Jesus."